I love a good premise. 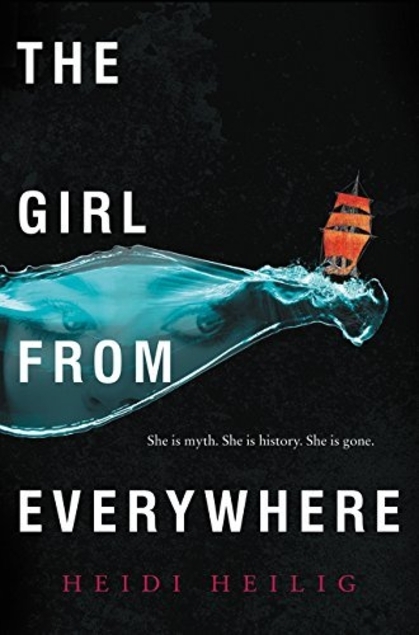 I love good characters, but I usually pick up books because something in the premise grabs me—so how could I resist The Girl from Everywhere by Heidi Heilig? It’s a fantasy of traveling to anywhere a map records—in the present or the past, real or imagined. For sixteen-year-old Nix, this is normal. She’s lived her whole life aboard her father’s sailing ship, as he sails them into history. But he’s on a quest to the one place he can’t seem to reach: Hawaii, 1868, the time and place when Nix was born—and her mother died. Her father hopes to find the perfect map to change the past, while Nix fears what that will mean for her life—and even for her existence. The book takes us through several times and places, and while I almost always wind up wanting more with this kind of premise, I liked the places we got to visit and how well they were brought to life. The magic is fascinating, especially as more rules and details emerge around just how this fantastical travel works. From the good premise the torch was picked up by good characters. Nix is likable and tough with vulnerabilities she keeps carefully hidden. She’s cautious about commitments, sometimes impulsive, and struggles with complicated choices, sometimes making questionable ones. She’s also smart and creative and game for adventure. Nix’s relationship with her father is complicated and uncertain as they do a kind of dance around each other—they need each other and they care about each other but there’s an estrangement between them too, largely because of her father’s quest and apparent disregard for its potential consequences for Nix. But I like the subtlety here, not making the father a villain but making him sometimes weak, and very human. And then there’s Kash. Roguish, charming, he stepped out of 1001 Arabian Nights—literally. He came aboard from a fantastical map of the Middle East and never quite loses that charming mystery. He’s Nix’s best friend and maybe more, with a nice interplay between them. Even the more minor supporting characters on the ship are a lot of fun, particularly one whose name I cannot recall! But she’s a tough warrior whose ghost wife is still hanging around the ship, doing annoying things like spilling buckets and chiding her to go out on the town. It’s adorable. Incidentally, this is also a good book for my diversity challenge—Nix is mixed Caucasian and Chinese, Kash is Arabian, and that character’s whose name I can’t recall was (unspecified) African. This was a delightful book in many ways, but not quite a conclusive ending…so I checked the web and there’s a sequel coming out in about a month. I am rather proud to say that I’m first in line on my library’s hold list!